The snow crunched loudly in the still air as I staggered along a narrow path to the latrine area. Although groggy, I realized one step to either side and I would be up to my waist in snow. But on the narrow foot path packed hard by several days use, bleary and shocked by the early morning cold, I walked onward, one gentle step after another. Heavy steam rose from a stream of urine burning holes through the deep snow, penetrating through the deep layers to perhaps the ground, but I doubted it went that far before losing 66.6 of its 98.6 degrees of warmth. As I waited, I thought I should have gotten up during the night. I should have relieved myself of some of that cocoa, some of the tea, or the quarts of melt water that kept the stove humming through the evening. We had stayed up until a darkness so complete, so whole pressed the final flicker of light from the stove. The fuel had given out. Then a cold so invasive, so enveloping knocked out the steady pulse of heat from the stove and went on to sap what dimness escaped our headlamps. The batteries had given out. In a sudden panic, I dove to the bottom of my snow shelter, eager to forget my dwindling presence, and desperately hopeful our remaining time might be fruitful. The Crystal Creek Pack had not gone far the entire day. At least not far for a wolf pack. They seemed to be active among the thermal areas north of our observation site, and very likely hanging around a carcass we had discovered. A grizzly had been on the carcass, a massive boar which we had been picturing as being somewhat ornery (what fun is in picturing a happy grizzly boar? ), several ravens, and even a bald eagle perched patiently awaiting its turn. But we had not seen the wolves. A pack of 15 wolves would not overlook this resource; in fact, these wolves may have been responsible for the resource to which the hungry bear had so graciously helped himself. The wolves had been all through the mosaic pattern of thermal areas dotting the hills. Their tracks could be seen crossing from one to the next, disappearing over a hill only to reappear on the next. They had left a story we could follow, all without showing themselves, not a single one. This matter I had been struggling with the most. There was no doubt that I had made contact with this wolf pack. The clues Dan and I had found over the course of this expedition had kept us on their path, deducing along the way the manner with which they spent their days in this vast, wild land. I had learned much, and for that I was satisfied. The land itself had taught me even more. Taught me about my motives, my abilities, and my limitations. The growth I desired the most; however, rested with the wolves of the pack. The passion that fueled my actions to this point, with all else tapped and gone, was making the connection between the past and the present through reacquainting myself with members of the current Crystal Creek Pack. My reasons there were two, or at least there were two wolves I was most interested in reestablishing contact. Thoughts of seeing them stuck with me, turning over repeatedly until I had supposed for the umpteenth time in my mind, what I was going to see. Dan called me to the deck. He had climbed the Grand Staircase first-thing, not even making the obligatory stop at the latrine, to pick up radio signals in the half-light of dawn. The broadcast was clear, and each frequency was present. The location of the pack had not changed. They might stay on this carcass for days, particularly if the remains are that of an adult bison. This unappealing thought and a cold, slow-starting morning drained our enthusiasm. By 8 a.m. I was down the Grand making coffee and lukewarm breakfast. Piling pads into my snow seat, I sat back, relaxed and while sipping between tiny wisps of steam, followed my wandering mind. Four years down the line the pack composition is nothing of what I knew in 1995. Of the 6 I followed then, only one remains. Yet, that one, Number 5, is still the one and only alpha female. Among several years of her offspring, 14 in all, Number 5 remains the central figure of the pack. Would I still recognize Her Majesty if I saw her? It had been awhile. Looking now beyond the expanse of Pelican Valley to Yellowstone Lake lying under a blanket of snow and ice, I thought that I would recognize her. I have found that an old wolf rarely loses her distinctiveness, but rather, with each year acquires another measure of it. Dan joined me at the camp for food and cocoa. He was talking departure as any prudent expedition leader would at this point; however, I was not ready to hear it. Rather as a matter of habit I had been packing and preparing for the inevitable departure, but otherwise I was finding it altogether hard to extract myself. We spent the better part of an afternoon making these preparations and nursing our soar spots. I cared for my fingertips, all of which were chapped and dry from handling wet and cold equipment in the snow. A painful split was started on my thumb that I soaked in ointment and covered with tape. The count was still ten, though, on both my hands and feet, so overall I was enduring well. The afternoon came with a sudden surprise: our regular checks revealed the pack had moved. We could not fathom their motives, but what had been strong, consistent signals in one drainage turned to weak and intermittent signals in an adjacent drainage to the north. We scanned with renewed vigor to find a trail of tracks, undoubtedly that of a wolf pack, crossing through an opening in the timber between the two drainages. They had abandoned the carcass site and crossed over the ridge just north of us. We would have seen them had we been watching. Again, they sneaked past us, and again, that feeling of frustration was felt. Tracks through the clearings among the trees indicated the pack had moved through the area north of us. Had we been watching at the time, we would have seen fifteen wolves on the move. The move revitalized our hope of seeing them: the signals were getting stronger and it seemed they were traveling toward open areas of the valley. We set up a new observation platform that afforded the best view of the terrain in which we would see the pack, if at all. As evening approached the odds were beginning to lean in our favor, yet we still were waiting at the threshold. After some time, the need for food and a warm drink drove me back to the camp. Dan held the watch and instructed me to monitor my radio for his call should something pop up. Back at the shelters I dreamed up a few new ways to prepare food. With some ingredients exhausted and little fuel with which to prepare a meal, I had to be creative. The entry would be: jambalaya of remaining bag contents, not unlike a tossed salad. The afternoon report crackled over the radio as I sorted through the food bags collecting the many crumbs. I sat back compiling these scant remains, and studying the peaks on the horizon. With sudden recognition I noticed several of the mountains I saw were the same as those one can see from the Lamar Valley. Time and careful map study had revealed each peaks identity to me, prompting me to realize how nearly adjacent the two valleys were, particularly for a wolf. When they inhabited the Lamar, the Crystal wolves would often make a run through Pelican. After the Druid wolves came to occupy the Lamar, a member of the pack, Number 104, made his way past these peaks to Pelican. I knew 104 well as the bold black yearling that did not mind a crowd. That is, he was often highly tolerant of humans. Perhaps more adventurous, and certainly more independent, 104 lived his early years as the star of the Lamar. In stark contrast to his Druid pack mates, 104 was often out and about, and was often being observed by people like myself. He rapidly grew into the archetype wolf that had been predicted by many who surmised that some wolves would adapt to the presence of humans, ignore them, and exhibit their natural behavior. Two aspects of Yellowstone to the making of this wolf: the (1) protection from and (2) continual presence of humans. Just when 104 had captured our fancy in giving us an unprecedented view of his life, he left altogether. 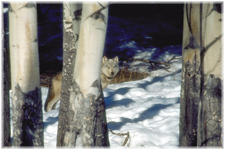 Shortly after Number 5s long-time mate, Number 6 died in the fall of 1998, 104 found his way into the Crystal Creek Pack, perhaps filling the vacant alpha male role vacated by 6. He has been in the ranks of Crystal ever since, but due to the lack of observations of this pack, his role has never been confirmed. Regardless of his present role, his past role as our entertainer in the Lamar has not been filled. 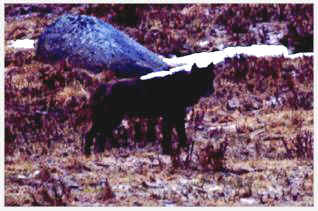 In fact, most found it bitterly ironic that a wolf of 104s special nature becomes a member of a pack that spends nearly all of its time in remote backcountry areas. With a sighting of the pack, would I again see 104? Certainly, I would recognize him. How could I forget one so familiar? "Come quick, I see em." I sprung up and looked around for Dan, thinking he had come upon me in my revere. But his voice had come from the radio sitting next to me. I raced to observation platform, grabbing food and gear along the way. A frantic sprint and I was there. Breathlessly I collapsed in front of my scope, still set up from hours earlier. Dan had caught them moving across the drainage and had fully expected them to be though and gone by the time I arrived. I focused on the distant wolves as they marched across the opening. Indeed, they would only be visible for a moment, but it appeared I had captured that one moment. Ten days, five nights in the snow, hour upon hour of patience had led up to this, this one glimpse. Stung out in a line, the pack was wandering west, apparently retracing some ground they had covered earlier. They were in no hurry, just plodding along. As the lead wolf was passing out of sight to the west, I panned back along the long line for a count. Fifteen. All were present and accounted for. Passing back over the line, a sudden flurry of wolves running counter to the direction of travel disrupted their linear march. "Whoa, whats scaring them?" We searched for people or other wolves in the area. They were the only known source of disturbance in the area. But upon closer examination, we could clearly discern the tracks of a ski patrol that had gone up that drainage earlier in the day. It was appearing to us that these tracks were the cause of the wolves fear and subsequent sprint in the opposite direction. Now all the wolves were out of site, running head-long through the forest. We had prepared ourselves for a brief sighting, but this was all too brief, and quite dramatic. Our confusion and disappointment had little time to settle, for minutes later a few wolves were back in the clearing, ambling around as if nothing was wrong. Several of them were looking to the west, but did not appear to be alarmed. They began snooping through some bare-ground areas, likely among some thermal vents and other Yellowstone warm ground features. Two began to play and chase one another a bit, but nothing serious. As the thirteenth, fourteenth, and final wolf appeared in the clearing, a few were heading west again taking the same route as before. This time we concentrated on the lead wolf, a large gray, and noted its every move. It slowed as it approached the tracks, and finally crept up to them as if they were the edge of a cliff. Its nose touched the tracks for all of a second before the wolf whirled around and was off at a gallop once again. Its retreat spread quickly to the others and again the entire pack was gone. Like an invisible fence the tracks held the pack from crossing, panic-stricken at first, but as the cycle repeated itself, less stricken with each attempt. It held tight, no wolf would cross, but the extreme nature of their reaction was subsiding. As a consequence that favored our fortunes, the pack would reassemble in the clearing before attempting to cross again. There they would greet each other and interact. Playing began to spread among the pups to the yearlings. Each time there was more and more energy that needed to be released. They were no longer covering the miles, but rather they were confined for the time to this one clearing. Among the leadership group, a pod of four or five wolves, was a very familiar gray wolf that we were convinced was Number 5. She was as I had remembered. Dan, for his part, had known this wolf quite well, for the same reasons as mehe was one of the first biologists on the wolf research team; and there was very little doubt between the two of us that we were seeing her. She carried herself like none of the others. There was confidence and poise oozing from her every mannerism. Several times she was greeted submissively by other pack members. She carried her tail high and went among the many wolves assured of herself and approving of all others. She settled down and bedded soon after we identified her. Watching from this position, she was the only wolf to stay as the pack continued their harried pattern of approach and retreat. The period of regrouping, when the wolves would gradually reassemble in the clearing, began to lengthen. We saw more interactions between different wolves including more of the characters we wished to identify. Among the more respected of the large, black wolves was one with very distinct characteristics. "Look at that 42-style tail," I told Dan, referring to the heritable traits a mother might pass to her son. I had long suspected that 104 was 42s son, and seeing those distinctly Druid features became convinced I had 104 picked out. He was very playful and engaged in a lot of chase and play with the many pups in the pack. Most wolves approached him submissively, so we ascertained his rank in the pack was high. But was he the top-dog? No, another wolf would claim this title, at least in our determination, before our time with the pack was done. A large gray male would go down the list of alpha-type behaviors, from scent-mark to dominance displays, during the course of our observation. No other wolf rivaled his prominence in the pack. The behavior of this wolf who we were ultimately unable to identify (to the number), suggested he was the alpha male of the Crystal Creek Pack. Since the death of Number 6, we have wondered about the identity of the wolf that had taken this position. We were finally getting the information we had wanted. The pack played until dark. There were 5, 6, 7, or more wolves running in a game of chase and tag. The lead wolf would run playfully away from the group, tail tucked underneath, pursued for a time by the others. We were starting to recognize some of the wolves in other, more minor roles in the pack. Some of the yearlings and pups were very much like the clowns of the troupe, while still others seemed more complacent and rested beside Number 5. As the light faded on the revelry, we noticed that over two hours had passed since first seeing them. We had be riveted to our scopes, unaware of the passage of time. The final mood of the pack was that of confusion it seemed. They wanted to travel west but were denied each time. The leaders had settled down while the rest of the pack expended excess energy chasing and wrestling with one another. They had no direction for the time, and seemed a little unsure about what they would do. It was an amazing situation, no question about that. We talked and ate and rested that night under the stars, reviewing all that had been witnessed. The circumstances were such that we were able to answer many of our questions about the social order of the pack. We were able to identify key individuals including the sentimental favorites, 5 and 104. As I went back over the events in my mind for umpteenth time, I drifted off to sleep and dreamed it all again. In my dream I was a very powerful sorcerer that lived in a towering castle among jagged peaks. From my vantage I oversaw all that occurred in the beautiful valley below. A wolf pack ventured through, and for want to know them, I would cast an intricate spell. The spell was uncertainty, and the pack was subdued for a time sufficient to allow me to alleviate some of my own uncertainty, and then once again, they were free to roam. ). Rather, the pack was miles into a trek in the opposite direction, climbing up through the timber to the high plateaus, and the icy peaks, beyond. We heard the tracking airplane soon after and saw it circle many times over the high plateau north and east of us. The pack really was gone, heading for the Lamar, it appeared. 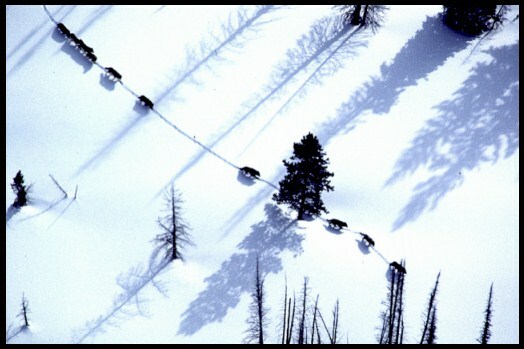 Doug Smith, NPS wolf biologist, contacted us by radio while flying over a long line of wolves on the go. "Did you guys scare the wolves?" Smith asked. He could tell there was some element of escape in their travel demeanor. We told him the whole story condensing the 2-hour observation into a 2-minute radio conversation. The plane came our way after several passes over the pack. We instructed Roger Stradley, the veteran wolf tracking pilot, to fly up the adjacent drainage and tell us about the previous days carcass activity. They found it, a bison, right on the stream itself. 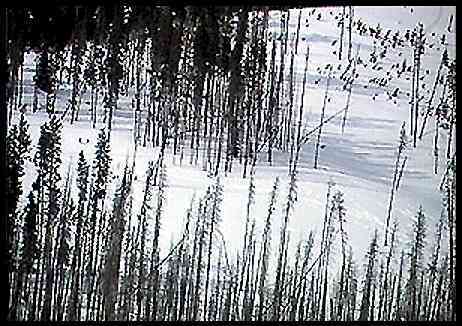 Roger maneuvered around the area following some grizzly tracks into the trees. Doug Smith and Roger Stradley fly over our observation point in the distinctly yellow wolf tracking airplane. "Sure enough. There is bear and wolf sign all over this area," Doug reported. "Were heading your way." Soon the bright yellow supercub was buzzing over our heads, Roger and Doug visible though the windows. They caught us on our observation deck, above the Grand Staircase, sprawled out on mats among the scopes and tripods. "Are you coming out today?" Doug asked. Dan was already thinking about preparations for his return, as not all the items on his list had been crossed off. He had bison-wolf interactions to observe. After what we found on our 10-day expedition, it was looking quite likely to happen. I envied his return, even as much in need of rest as I was. I knew the potential that existed here. As we packed up and skied out, all pain and soreness took a back-seat in my mind. There had been too much to be amazed about, too much to savor and enjoy to really be caught up in the building exhaustion that came with the end. The sun had come out again and was baking the snow flats of the valley as I swished along tugging my load. Trepidation had been replaced with certitude. The Pelican Valley expedition was an unequivocal success.